In the end, more than anything else, we regret the small chances we didn’t take, the priceless relationships we were too busy to nurture, and the good decisions we waited too long to make. I learned this through extensive experience. Angel and I have spent the past decade coaching hundreds of students and clients from all over the world, and the same exact regrets relentlessly pop up in the personal stories people share with us. Below, we’re going to take a look at ten of these common regrets, and then cover some principles and strategies for avoiding and overcoming them. Not spending enough quality time with the right people. — At some point, you’ll just want to be around the few people who make you smile for all the right reasons. So today, spend more time with those who help you love yourself more—spend more time with those who make you feel good, and less time with those who you feel pressured to impress. Never be too busy to make room in your day for the ones who matter most. And remember that nothing you can give will ever be more appreciated than your sincere, focused attention—your full presence. Truly being with someone, and listening without a clock and without anticipation of the next event, is the ultimate compliment. Not expressing your love openly and honestly with those you love. — Without question, you’re going to lose people in your life. Realize that no matter how much time you spend with someone, or how much you appreciate them, sometimes it will never seem like you had enough time together. Don’t learn this lesson the hard way. Express your love! Tell people what you need to tell them. Don’t shy away from important conversations because you feel awkward or uncomfortable. You never know when you might lose your opportunity. Is it really possible to tell someone what you feel? Yes, it is. They won’t always understand, because even when they’ve heard you, they can’t feel exactly what you feel inside. But you still have to speak up for your own peace of mind. If you appreciate someone today, tell them. If you have something else important to say, say it. Hearts are often confused and broken open by words left unspoken. Basing a significant portion of your self-worth on other people’s opinions of you. — We tend to forget that most people judge us based on experiences from their own life that have absolutely nothing to do with us. For example, a person might assume things about you based entirely on a troubled past experience they had with someone else who looks somewhat like you. Therefore, basing any part of your self-worth on what they think puts you in limbo—you are literally at the mercy of their unreliable, bias perspective. If they see you in the right light, and respond to you in a positive, affirming manner, then you feel good about yourself. And if not, you feel like you did something wrong. The bottom line is that you will never find your worth in another human being—you find it in yourself, and then you will attract those who are worthy of your energy. And in the meantime, not overreacting or taking things personally will keep your mind clear and your heart at peace. Letting uncertainty paralyze you. — Trust me now and thank me later, embrace uncertainty! Because some of the most incredible chapters of your life won’t have a title you feel comfortable with until much later. Living is risky business. Every decision, every interaction, every step, every time you get out of bed in the morning, you take a small, uncertain risk. To truly live is to know you’re getting up and taking that risk, and to trust yourself to take it. If you don’t—if you let uncertainty win—you will never know anything for sure, and in many ways this unknowing will be worse than finding out your hunch was wrong. Because if you were wrong, you could make adjustments and carry on with your life without ever looking back and wondering what might have been. Remember this, and find the courage you need! You don’t need guarantees 24/7. That’s not how life works. In life you can be comfortable or courageous, but not both at once. Focusing on failures instead of opportunities. — Well, it’s true, you have failed and you have been hurt in the past. But it’s also true that you have loved, and been loved. That you have risked, and received. That you have grown not just older, but wiser. And all of this carries a weight of its own—a greater weight than any particular failure or wound. In fact, it’s better to have a life full of small wounds and failures that you learned from, rather than a lifetime filled with the regrets of never trying. Think about it! Have you ever seen a toddler learn to walk? They stumble and fall numerous times before getting it right. The falls are learning opportunities. Oftentimes it takes pain and patience to make lasting progress. So don’t let time pass you by like a hand waving from a train you desperately want to be on. Don’t spend the rest of your life thinking about why you didn’t do what you can do right now. Holding on too tight to every ideal, and then missing out on real opportunities. — You can’t lose what you never had, you can’t keep what’s not yours, and you can’t hold on to something that does not want to stay. But you can drive yourself mad by trying. What you need to realize is that most things are only a part of your life because you keep thinking about them. Stop holding on to what hurts, and make room for what feels right! Do not let what is out of your control interfere with all the things you can control. In other words, say “goodbye” to what didn’t work out so you can say “hello” to what might. In life, goodbyes are a gift. When certain people walk away from you, and certain opportunities close their doors on you, there is no need to hold on to them or pray to keep them present in your life. If they close you out, take it as a direct indication that these people, circumstances and opportunities are not part of the next chapter in your life. It’s a hint that your personal growth requires someone different or something more, and life is simply making room. Playing the victim for far too long. — If you always play the victim, you will always be treated like one. Life isn’t fair, but you don’t have to let the past define your future. Remember that time you thought you couldn’t make it through? You did, and you’ll do it again. Don’t let your challenges get the best of you. Don’t let your insecurities bully you into a corner. Don’t be your own victim! Take the next smallest step. The greatest of all mistakes is to do nothing simply because you can only do a little. And you can ALWAYS do a little! Where you are right now is necessary. Sometimes we avoid experiencing exactly where we are because we have developed a belief, based on our ideals, that it is not where we should be. But the truth is, where you are right now is exactly where you need to be to take the next smallest step forward. Being too busy to appreciate your life. — Take action, work hard, but don’t forget to pause and pay attention to life’s little moments too. That’s honestly the best advice there is. Realize that life is simply a collection of little chances for happiness, each lived one moment at a time. That some time each day should be spent noticing the beauty in the space between the big events. That moments of dreaming and sunsets and refreshing breezes cannot be bettered. But most of all, realize that life is about being present, watching and listening and working without a clock and without anticipation of results at every moment, and sometimes, on really good days, for letting these little moments fill your heart with intense gratitude. Truth be told, you will inevitably, whether tomorrow or on your deathbed, come to wish that you had spent less time worrying and rushing through your life, and more time actually being mindful and appreciative of each day. The points above are crucial reminders, but what if you already have regrets you’re desperately struggling with? No doubt, the feelings of regret sometimes sneak up on the best of us. As alluring as the idea of living a regret-free life sounds, it’s rarely an easy feat. We regret not spending our time and energy more wisely. We regret situations and conversations that didn’t go well. We regret not speaking up when we had the chance. We regret getting into toxic relationships, or making mistakes in past relationships. Yes, even when we know better, we regret things. And we do so simply because we worry that we should have made different decisions in the past. We should have done a better job, but didn’t. We should have given a relationship another chance, but didn’t. We should have started that business, but didn’t. And so on and so forth. We compare the real outcomes of our past decisions to an ideal fantasy of how things “should” be. In other words, we have a fairy tale dancing around in our heads of what could have been, if only we had made different decisions. The problem, of course, is that we can’t change those decisions, because we can’t change the past. Yet we resist this truth to no end—we keep overanalyzing and comparing the unchangeable reality to our ideal fantasy until we’ve wasted days of our lives in head-spinning misery. If we logically know better, why can’t we just let all our ideals and fantasies GO? Because we identify personally with these ideals and fantasies. We all have this vision in our minds of who we are—our well-meaning intentions, our intelligence, our social impact, etc. And we make the best decisions we can, of course, because, again, we generally mean well. Even if you struggle with deep-seeded self-esteem issues, you probably still identify with yourself as being a decent and respectful human being. And so when someone says something about us that contradicts the vision of ourselves that we identify with—they insult our intentions, our intelligence, our status, etc.—we take offense. We feel personally attacked, and we have a hard time letting it go. Something very similar happens when we believe we did something—made a mistake—that contradicts that same vision of ourselves that we identify with. We take offense! In some cases we implode on ourselves—we berate ourselves for making the mistake … “How could I have done this?” we think. “Why couldn’t I have been smarter and made a better decision?” And again, we have a hard time letting it go—we have a hard time coming to grips with the fact that we aren’t ALWAYS as good as the vision we have of ourselves. So in a nutshell, our ideals and fantasies about ourselves tend to cause us lots of misery. Every bad decision we made in the past is done—none of them can be changed. And in fact there’s some good in every one of those bad decisions too, if we choose to see it. Just being able to make a decision at all is a gift, as is being able to wake up in the morning, and being able to learn and grow from our wide-ranging life experiences. We are not actually what we envision ourselves to be, at least not always. We are human and therefore we are multi-layered and imperfect. We do good things, we make mistakes, we give back, we are selfish, we are honest, and we tell white lies sometimes. Even when we are doing our absolute best, we are prone to slip. And once we embrace this and get comfortable with our humanness, making a bad decision tends to conflict a lot less with our new, more flexible (and accurate) vision of ourselves. Of course, all of this is easier said than done, but whenever you find yourself obsessing over and regretting a past decision, you can 1) acknowledge that you’re falling into this pattern, 2) realize that there’s some ideal or fantasy you’re comparing your decisions and yourself to, and 3) let go of this ideal or fantasy and embrace a wider range of reality by making peace with what’s behind you, so you can focus more on what’s ahead. One day you will find yourself close to the end, thinking about the beginning. I challenge you to put the principles of this article to good use! What’s one thing you CAN do today that you know you will NOT regret? Please leave a comment below and share your answer with us. Another worthy read, M&A! I’m both a past attendee at your Think Better Live Better seminar and a current student in your Getting Happiness course and coaching, and this short article provides such invaluable reminders of what I’ve learned from you. And it gives me a healthy push to get back into the course and seminar recordings and implement more of the useful tools you’ve provided. Also, thank you so much for the refresher about overcoming old regrets! I’ve been successfully building and maintaining several small, daily rituals in my life since I started your course, and I often catch myself regretting the fact that I didn’t start sooner…among struggling with other old regrets. So this helps. Barbara, It’s excellent to hear that this post helped reinforce what you’ve learned from our course and conference. Keep on keeping on! 🙂 And thank you for supporting our work. Boom! This one arrived in my email with perfect timing. I’ve been working on letting go of a big regret I have about not spending more time with my family over the past 15 years of running a successful business. But I’ve been doing my best to redirect this energy and focus on the present day so I can do my best to be present with my family today–I can’t correct the past, but I can make the most of today…that’s something I know I won’t regret. Me, too. I decided that now that I mostly retired, I will fix that. The problem is that businesses on both sides have taken us to different and far away parts of the country. I am in a State I love living in, have my ideal house on a piece of property to die for. They live in a State with a climate I hate. But you know? I love them and want to be with them more than all that other stuff. And so, I’m taking photos of the beautiful things here, packing up and moving. And I am so elated that I’ve made the decision to go to my new life filled with the people I love. 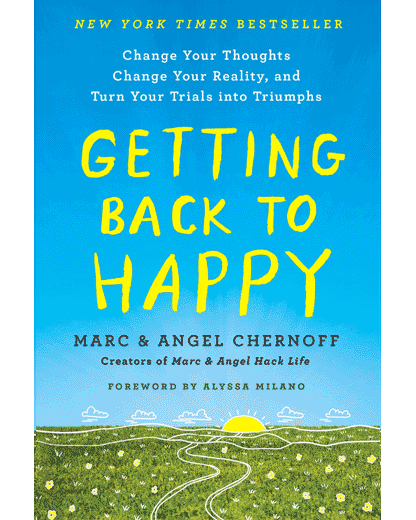 Marc and Angel, I’ve used your book and teachings to work through the regrets I had following my divorce last year. This write-up really brings some extra perspective, and I appreciate that. Today, I will love myself by taking a run, eating healthy, and meditating for a little while. This evening, I know I will be happy I did. I can remind everyone in my life that I love them. I believe that things happen to us for a reason. This morning I was struggling with a report I recently received, from my doctor; regarding my on going work with managing my Anxiety & severe Somataform disorder. My struggle is that I have been looking back & feeling sad about opportunities missed. Today, I will go forward. Acknowledge that I have reached my maximum recovery & be okay with living with this disorder (I was diagnosed 4 years ago) & stop waiting for it to go away. This is who I am & This is were my life begins again! Thank you for the opportunity to learn how to go toward. I think after reading this article I can to Let Go and start with new zeal and focus on my business and passion !! … I think after reading this article I can start to Let Go and start with new zeal and focus on my business and passion !! Thanks a million…today was one of those days that I felt regret in all 10..smh! Thank you fora different perspective…it may have changed my life. Regarding number 7, when it is your child who has decided to reject you for reasons you know are untrue, it is a bitter pill, and an ideal- i.e. that your child should love you and have a close relationship with you- that is hard to let go of. When he starts bad-mouthing you to your other children and your friends it is even more difficult to “go high when they go low.” When you are now excluded from family events and get-togethers because of him, it’s hard to pull up your socks and walk away. And yet, what other choice is there? You can’t change the way someone feels or thinks. You can’t resolve a problem when the person refuses to talk to you. So, like it or not, there is just to move on, and try to put aside the ideal of a happy family that you thought you were creating, and go live your life. A problem is like a big rock dropped in a stream – the water makes a new path around it, heads in a different direction. So I can choose to let go of what I once wanted, and embrace a new reality. But no one said it would be easy. The mother-child bond, on the mother’s part at least, is very strong. It’s hard to think of your children as just another person who doesn’t want to be around you for their own reasons. Yet what else makes sense? So on I will go, creating a life of extraordinary experiences with people who choose to come with me. And who loses out in this equation? Not me. Thanks for all your shared wisdom. It helps more than you know. I couldn’t agree more. When it comes to your children for whatever reasons they decide to not have a mother daughter bonding no matter what I do it’s sad. But I try not to let it hold me back. I have even shared some insight from the blogs if it has had impact I don’t know. But I will forever love my child. Thank you so much for this article, it’s my birthday today and I’ve been feeling quite reflective. I really do feel like today is the first day of the rest of my life. It’s time to let go and step into my best life! You always make so much sense but this article definitely resonates with the deepest part of my heart. God bless you Marc and Angel, day made! I am really in love with your posts. I really really love how this post is written, it is beautifully written as always. I love how you two never fail to share meaningful insights with us all, and I am extremely touched to have read this. It is such a great read, and it is very selfless for you all to share this knowledge with us. I have been procrastinating revising for my upcoming End-of-year Examinations. Well, I know that starting now would be one thing I definitely would not regret today. So I will set off to study soon. In life, there will be ups and downs. We just have to enjoy the ride! We would never be perfect, but the baseline is to accept where we are, make peace with where we are at, and continue moving forward! Oh my gosh, where to begin. Well, today is a good day to begin, as I turn 65. I know I am my own worst enemy. I have learned how to talk myself back out of a terrible place. I forget sometimes and end up in that same terrible place. Well I need a talking to today. We don’t know how many more today’s we will have. One problem is that, yes, this is a constant battle. Another day of talking myself back to reality. So I am going to have a chat with myself, get ready, and go and enjoy my birthday today. Thank you so much. I needed to read this today. BRILLIANTLY and I hope people don’t have to go thru what I had to inorder for me to learn this lesson. Two years ago I had a serious cycling accident that left me without a memory due to severe brain damage and also numerous titanium implants to correct a smashed body. After much therapy, my brain began to heal and I realized just how much I value the people in my life. They are the only thing that matters in life. Now, I spend all my time planning trips to see them when my brain heals more. All the travel to foreign countries no longer holds any interest to me. Loved ones are all we really have. Great Post! Really nice to read some original and thought-provoking content on such an often covered topic. Exercise. Read. Tell someone I love them. Sing! I’m a regular reader. Thank you for the guidance you provide. I love your info. This is very helpful. I am passing it on to my sixteen year old daughter hoping this will help her not go through regret. Just yesterday I wrote down my long term goals and what I will regret at the end of my life if I don’t pursue those goals. I’m looking for new jobs in my field but I what I really want is a new career altogether; I even know what I would like to do but I’m scared to take the plunge and start at the bottom again. Great post! You touched on so many important facets of humanity. To be loving in my interactions, never to belittle another soul. Even if I disagree, or dislike something I can be considerate and respectful in my interactions with others. Sometimes that may mean just walking away. wow. every article you write is so powerful and effective, this concentration of Regrets has covered all my cause and effect that still linger. I am forever regreting, questioning and feeling the guilt of what else could I have done? how can I make it better? my best wasn’t good enough. I discourage myself, then overwork to make it better but that doesn’t work, now I have some tools to move on.Thank you!! I was just telling someone today how I dislike the word “regret”. I have no regrets. Everything I have been through, good and bad, has been a life experience. We make decisions which, at the time, may seem like the right choice. We can’t predict the future and only time will tell whether its a good decision or a bad one. Its a lesson in life. I wish the word can be taken out of existence. Accept the choice you made and move on. Its in the past. Learn from it. Great article, Marc. Reminded me of Bronnie Ware’s 5 most common regrets in our lives. She’s on TEDx Talks with a talk about regret-free living. Nail on the head. So accurate. It’s scary. Have a good weekend. You guys help me so much.